This 3-day tour is a combo of natural scenery and ancient villages. It offers a chance to see the highlights of the Yellow Mountains, featuring imaginatively-named pines, oddly-shaped rocks, and a sea of clouds. A visit to Hongcun and Tunxi Ancient Street will take you back to the Ming and Qing dynasties (1368-1911) as you admire the traditional Hui style houses and ponds. We will make the best use of your time and energy during this magical holiday. Via bus, flight or train, no matter how you will travel to Huangshan, your private guide and driver will be ready and waiting for you with a sign of your name, ensuring a comfortable and efficient transfer. Enjoy an authentic Hui style lunch in a local restaurant, you will continue on to one of China&apos;s most beautiful ancient villages -Hongcun Village, a charming ancient village with a history of over 800 years. The village will show you the original Hui style architecture (a type of traditional Chinese architecture). After that you will be transferred to Tunxi Ancient Street (about one hour&apos;s drive). There you can enjoy a leisurely walk among the ancient buildings and look around to search for a bargain. Shanghai-Huangshan: There is usually only one flight between Shanghai and Huangshan every day. High-speed trains taking about 5 hours are recommended. 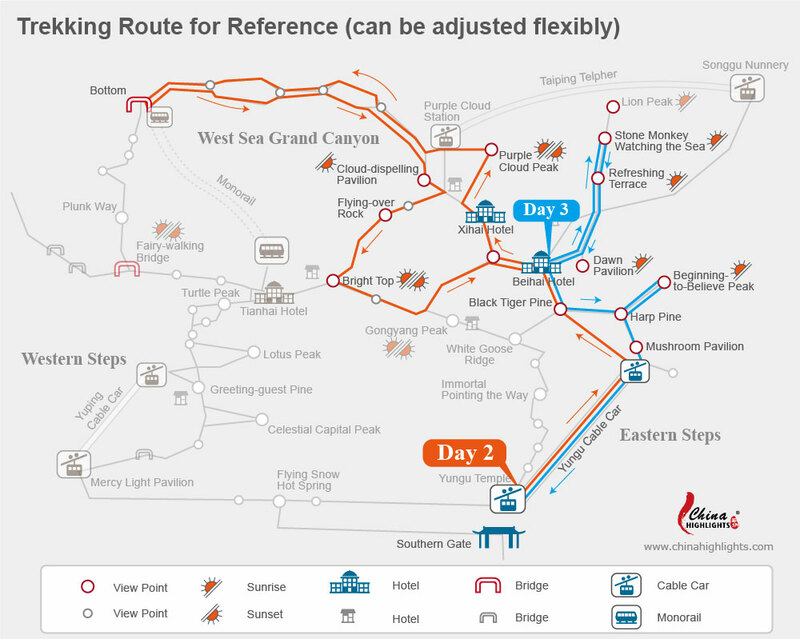 Hangzhou-Huangshan: High-speed trains between Hangzhou and Huangshan takes about 3½ hours, and express buses takes about 3 hours. Please inform which one you prefer. Today you will spend a day and a night on the Yellow Mountains. It takes about one hour from central Huangshan City to reach the foot of the Yellow Mountains. Your appreciation of the graceful Yellow Mountains begins with the Yungu cable car (a round-trip cable car is included). Don&apos;t miss the magnificent scenery along your 10-minute journey. Short Cut. From the Cloud-dispelling Pavilion to the button of West Sea Crand Canyon, it&apos;s down stairs all the way and some sections are very narrow and steep. Therefore, trekking in the West Sea Grand Canyon can be a big challenge, especially to your knees. A monorail is available to help you save time and strength. It runs between the bottom of the Canyon and the main peak area, which is about 300 meters (0.2 miles) from the Baiyun Hotel. The 893 meters (0.6 miles) takes less than five minutes and the cost is CNY80 (US$13) per person. Rise early and take the chance to photograph the sunrise at Refreshing Terrace, which is highly recommended by our past customers who have visited the Yellow Mountains. After breakfast in the hotel, walk to Lion Peak to see the Dawn Pavilion, Stone Monkey Watching the Sea, and all shapes of pines along the route. You can also climb up to Beginning-to-Believe Peak and overlook the Mushroom Pavilion. Your discovery of the Yellow Mountains will finish with the Yungu Cable Car journey. The above prices are not applicable to weekends and National Holidays. INQUIRY Each tour can be tailored.